Goalkeeper Helen Alderson was proud of Durham Wildcats’ attitude after Everton kept their own FA Women’s Super League 2 promotion hopes alive with a crucial 3-1 win at New Ferens Park. First-half headers from Gabby George and Claudia Walker set Everton on their way to a ninth win of the season, with Emily Davies' spectacular third putting the seal on it to cut the gap to Bristol to two points with two games left. Beth Hepple's stunning chip gave Durham hope but their challenge is now over after a fine campaign. And Alderson admitted everyone involved at Durham knew they had to go for the win and was immensely pleased with their attitude. "Everton are a very good side, the league table reflects that, Yeovil, Bristol and Everton are excellent footballing sides,” Alderson said. "You can see that on the pitch, they have a great pedigree, they have people who are good on the ball. "But it is a testament to ourselves that we've stayed in the game all the way through and looked threatening throughout. "We've let one in right at the end which maybe flatters them a little bit, but you have to go for it, don't you. Everton played some good football at New Ferens Park but it was their aerial prowess which proved vital. They went in front in the eighth minute when Michelle Hinnigan's drive from the edge of the box hammered off the crossbar with the alert George nodding the rebound wide of Helen Alderson's dive. And the advantage was doubled in the 26th minute when Walker's textbook header from Krystle Johnston's ball nestled in the net. Everton could have had the points in the bag by half-time, but Hinnigan saw Alderson make a diving save from a header and then went inches wide with a shot. Nine minutes from half time, Durham were back in it as Hepple lobbed Kirstie Levell from 30 yards. Everton had the best openings of the second half when Walker sent Johnston clear only for the ex-Sunderland winger to shoot wide, while Alderson made a superb low save from an Ellie Stewart header. And the Toffees had the last say deep in stoppage time when Davies netted a beauty from distance just seconds after coming on. 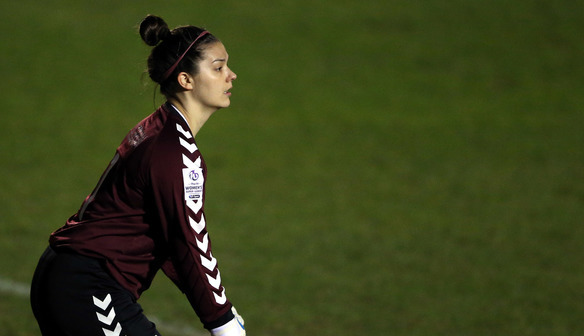 Though Alderson was disappointed with conceding at the death, she was pleased that they had initially fought back from 2-0 down against a high-quality side. "No points wasn't going to do anything for us, so we had to go for it and they got one against the run of play. "We were always in the game and the girls can hold their heads up high. "The first 20 minutes we maybe gave then too much respect and didn't track their runs as well as we should, their movement was fantastic.